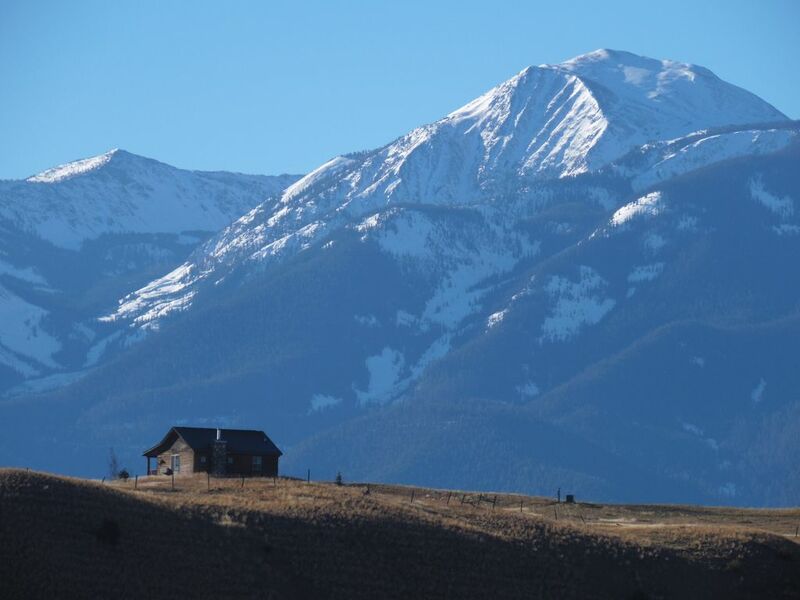 Elk Ridge cabin is perfectly situated on a 25 acre parcel at the base of the Absaroka-Beartooth Mountains. This cabin is one of two cabins on nearby acreages and is available for rent together or separately. See Dexter Peak cabin VRBO #187368. Just 35 miles north of Yellowstone Park,the cabins offer breathtaking views of four mountain ranges. Varying lights of the Montana skies and glimpses of nature and wildlife soothe the soul year round. Perfect for creative reflection, a romantic getaway, that special fishing trip or as a home base while enjoying the wealth of activities, breathtaking scenery and wildlife. A bright living room with tongue and groove pine ceilings and a river rock fireplace with wood burning river rock fireplace. Air conditioning will keep you comfortable in the event the temperatures get high. Every kitchen appliance imaginable is available for your use! Roast hotdogs or smore's around the campfire and enoy the big skies that Montana is famous for. Deer, elk, foxes, eagles, hawks abound the area so near the mountains. Wifi, flat-screen television with a extensive library of movies, music available. But we really want you to enjoy the great outdoors instead of these conveniences. Hike to a waterfall, peruse art galleries, fish, explore, relax, sunbathe, soak, fish, or whatever your heart desires! The Elk's Ridge Cabin sleeps four with a queen-size bed in one bedroom and a comfy queen-size sleeper sofa in the main room. The cabin has a full kitchen, stocked with the basic essentials, a gas BBQ, television, VCR/DVD with a selection of classic movies, a washer/dryer, wood-burning fireplace and an outdoor fire pit. The Elks’ Ridge cabin is named such as a herd of 200-300 elk often rest on this property when the weather turns. The cabin sits on a knoll with a view of the mountains in all directions and glimpses of the Yellowstone River to the west. Enjoy your favorite refreshment on the covered porch while the sun sets and casts its rosy glow on the mountains before you. The front door opens to a warm and welcoming knotty pine great room with a river rock wood-burning fireplace. The kitchen is well-appointed with a four-burner stove, a microwave, pots and pans, glassware, coffee pot and grinder, crock pot, blender, toaster, knives and more. The living room includes a 27” television, VCR/DVD, a stereo, selection of classic movies, a stereo, comfy queen-size sleep sofa, table and chairs, cards and cribbage board, board games. To the left of the living room, is the bedroom featuring a captivating queen-sized log bed, the headboard hand carved by the previous owner. Roast dogs and enjoy S’mores at the campfire pit nearby. Also, be sure to see our listing for the Dexter Peak Cabin on an adjacent property (187368). Sleeps 3-4 folks. I love to travel and have had a dream of owning a small resort with cabins and now that is what I am doing! I was born in Snoqualmie, Washington and have lived around the Seattle area during college. Sold real estate with Windermere in Kirkland for 15 years and then discovered Paradise Valley, Montana. Great cabin on a very special piece of property with views of the mountains and the Yellowstone River to boot! Quiet, views, lots of wildlife, great location near Yellowstone, Livingston and Chico Hot Springs. 15 minutes from renown Chico Hot Springs resort with clear, clean hot springs pool, dining, day spa, and saloon. Quiet location on 20 acres with a few homes or cabins in the area. Abundant wildlife. Breathtaking views of 3 mountain ranges; The Absoroka-Bearthooth, Gallatin and Crazy Mountains. View of the Yellowstone River. Gas log fireplace with remote control not to be used for primary heat source, just for ambiance. Rustic barn with garbage cans and recycle bins. Turn off for 20 seconds and restart if it is not working or running slow. Comfy living room is open to kitchen and dining area. Nice size refrigerator and freezer with ice cube trays. Stove oven is only 24" wide. Many pots and pans, preparation and storage dishes, all utensils. This area is in demand for pretty much everyone. From shopping the unique shops in Livingston, to dining in the locally owned restaurants, to fishing, hiking, floating, river-rafting, snow-shoeing, skiing, dog-sledding, soaking in natural or improved hot springs pools, horseback riding, museums, graveyards...we got it all! Kids will love the Museum of the Rockies and learn all about dinosaurs! We had a great stay! Close to various activities and quiet at the end of the day. Bathroom is a bit small and the bed frame is a toe buster! Plenty of kitchen utensils to make just about anything. My husband and I stayed for two nights with our two daughters and this cabin offers everything. Space to run around outside, a fire pit for the evening, the girls had fun watching the prairie dogs, we all loved watching the huge herds of elk traveling around. The gas fireplace was great and the inside of the cabin was so comfortable. Vicky and her family did a wonderful job of decorating it! We have rented a lot of VRBO's and by far this one is my favorite of them all! Thanks for a great getaway! Absolutely loved it! Perfect get away for my wife and I. So happy you enjoyed your stay! Love to have you back for a well-deserved getaway! Elk Ridge Cabin was well equipped and provided me with a wonderful retreat during my Thanksgiving visit to Paradise Valley. I look forward to returning in the near future. I highly recommend Elk Ridge Cabin. Loved relaxing by the fireplace in this comfortable cabin in the mountains! The owners had thought of every detail to help make our stay enjoyable! My husband I were celebrating our 35th wedding anniversary and everything was just perfect! The owners even left us a plate of cookies to welcome us! The cabin is furnished nicely with a beautiful log bed and artwork. The kitchen is well equipped. We found everything needed to steam crab legs and bake a pie. There was a scope set up at the window, we saw elk and deer from the cabin. The location is fabulous with close access to Yellowstone, Chico Hot Springs, and numerous fishing access points. This area is perfect for fly fishing and spotting wildlife. We spent one day at Nelson’s Spring Creek fishing, it was wonderful. I highly recommend this VRBO and hope to return next summer!! Music to my ears Natalie and Brian! So glad you had a very special anniversary in our cabin here in Paradise Valley and Yellowstone Park! Please come back for other special occasions or just to enjoy a different season! Thank you for choosing to stay in Elk Ridge Cabin! This cabin was perfect for a portion of our vacation while visiting Yellowstone National Park. Our 4 nights here went by way too fast and we definitely hope to return in the future. The mountain landscape around the cabin is stunning and we enjoyed watching the prairie dogs in the front yard and the herd of elk munching on the hay in the field behind us. So glad you enjoyed our cabin and that you got to see the elk. They come out of the hills most often in the fall to spring seasons. We also have had a doe and two fawns in the yard a lot. So fun to see them play. Love to have you return, perhaps another season. Thanks for taking great care of our cabin! Chico Hot Springs and their Dayspa is nearby. Music and dancing on the weekends. Massage available. Hike to Pine Creek Falls, breakfast at historic Pine Creek Lodge. Horseback riding, dog sledding, rodeos, art galleries, train museum and lots of fishing! Shining Mountain Gallery in Pray has arts and crafts from over 50 artists! Maximum pet fee is $45/$90 or $10 per day for each pet, not subject to tax. Pet fee is larger for longer stays. Deposit is fully refundable if cancelled at least 45 days in advance. If less than 45 days and cabin can be rerented, only a $100 cancellation fee will apply. If cabin cannot be re-rented than deposit is non-refundable and can be used in future. Add $15 for 1 night in high season. Holiday rates same as peak season rates.